Hydrostatic head instruments for measuring liquid level in vessels operating above atmospheric pressure uses the full capability of the differential pressure instruments with both sides of the measuring element connected to the vessel. 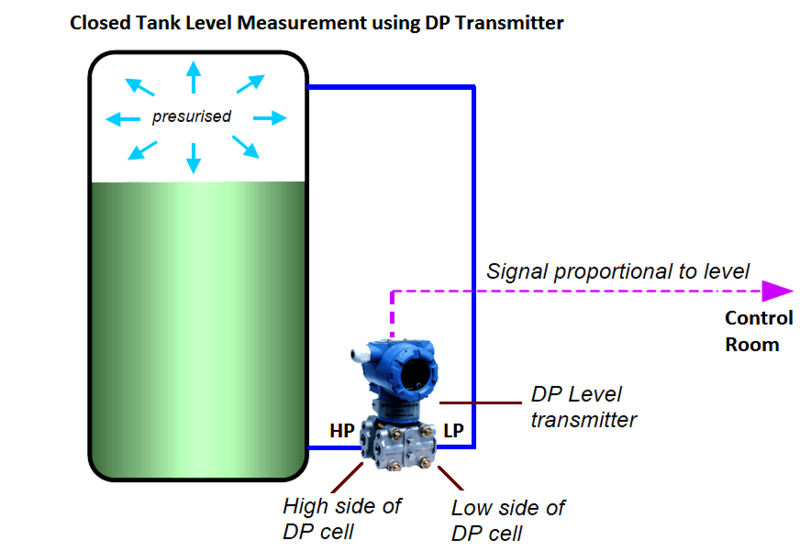 The differential pressure transmitter, enables an automatic subtraction of the pressure on the LP side, from the total pressure appearing at the HP side. This is accomplished as shown in diagram above, where the LP is connected above the maximum predicted level. With this arrangement, each increment of pressure above the liquid surface is applied to both capsule assemblies of the transmitter, and since they are in opposition, the increment is cancelled. 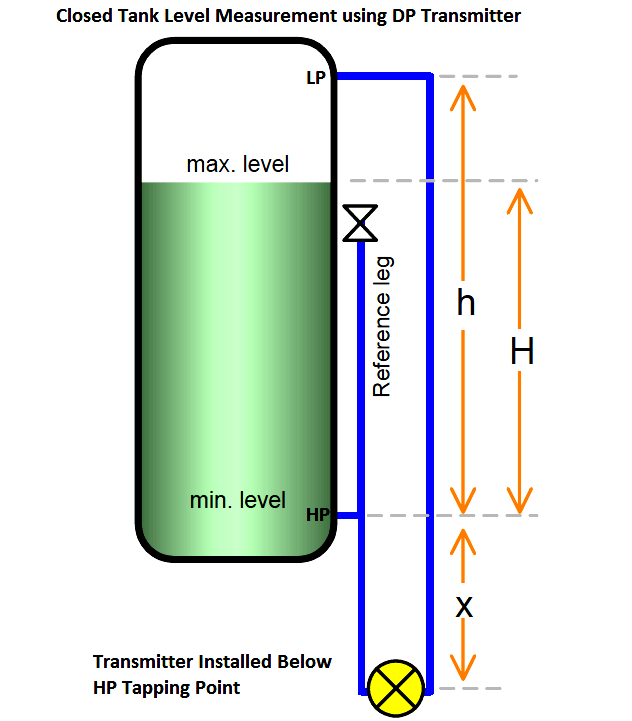 Only the hydrostatic pressure, which is applied to the HP, is effective in causing any response to the transmitter, which is proportional to the level. The DP transmitter have inbuilt pressure sensors like Diaphragm, capsules, strain gauges etc to measure the differential pressure. The pressure sensor converts the measured pressure into parameters like millivolts, capacitance, resistance etc depending on the type of pressure sensor we are using inside the DP transmitter. Generally a Wheatstone bridge will be used to convert resistance, capaciatance or inducatance type of pressure sensor outputs into electrical signal like millivolts or volts which is proportional to the pressure, then transmitter converts the pressure into equivalent Level Signal accordingly. The tank bottom tapping point is High pressure (HP) tapping point and Tank top tapping is Low Pressure (LP) tapping point. 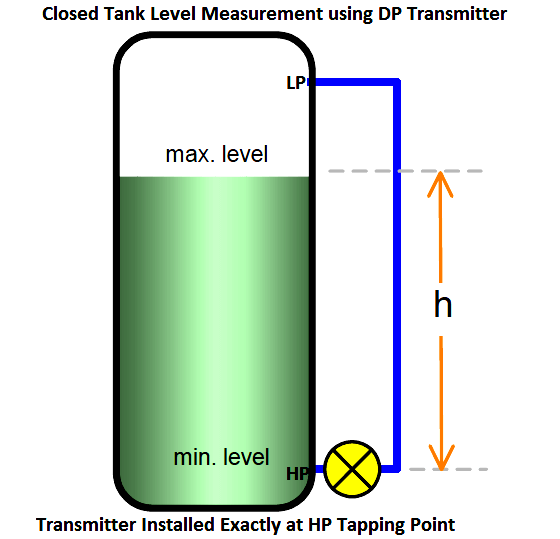 The DP Transmitter is connected at these HP & LP tapping points accordingly. 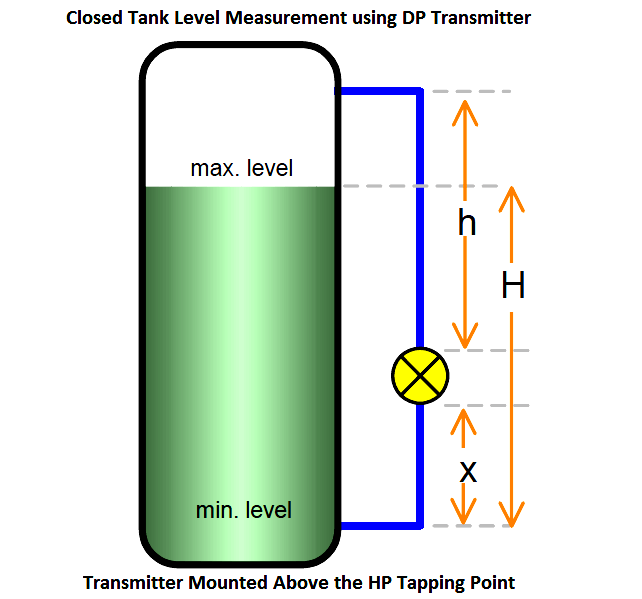 The DP Transmitter calibration parameters will vary depending on installation & seal system also. Generally we can see three possibilities of installation of a transmitter in the field. So we have to calibrate the transmitter depending on the type of installation in the field. The calibration formula will vary slightly depending on the installation.Every transmitter have two important parameters, they are Lower Range Value (LRV) & Upper Range Value (URV). We have to calculate the LRV & URV values based on type of installation. The below figures with formulas dictates the calculations. After calculating the values, configure the same parameters in the transmitter using HART communicator. Dry Leg : if LP impulse line is filled with air, gas or any other gases. 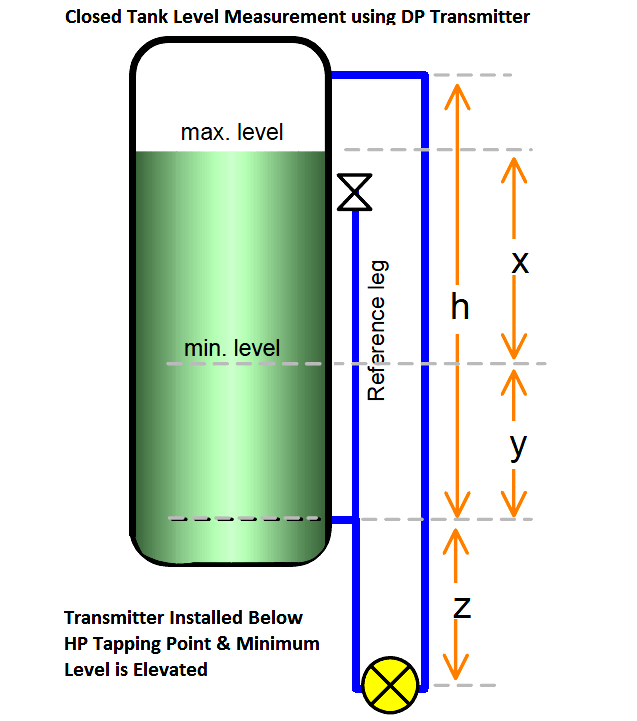 The hydro static pressures applying on DP transmitters will vary depending on wet leg or dry leg. so we have to consider these & calibration formula also varies accordingly. We can only decide for a particular DP transmitter is having Wet leg or Dry leg from the field installation & its process application. Sometimes we can make a dry leg installation into wet leg by filling water into the LP impulse line also. SGp = std. gravity of process liquid. If SG in close tank is fickle, sometime the value of SG is 0,8 and sometime 0.9, do we have to use wet leg or dry leg?? Muito show! Translated : Great!